Contaminated groundwater has been found on a second private property in the Hanover area. The contamination is from Rennie Farm, a site the College used as an experimental burial ground for laboratory animal waste in the 1960s and 1970s. The private property’s owners have not yet been identified. The waste from Dartmouth’s Rennie Farm property contains 1,4-dioxane, classified as a probable human carcinogen by the Environmental Protection Agency. The chemical is following a path north to northeast from the Rennie Farm property. This recent finding was found at a ground-monitoring well, at levels three times the state allotted limit for drinking water. The 1,4-dioxane groundwater standard is three micrograms per liter. In February, the first contaminated private property was discovered. Tests of the drinking water well at Richard and Deb Higgins’ home found levels of roughly six parts per billion of the chemical — double the state standard of three parts per billion. Even short-term inhalation exposure to high levels of 1,4-dioxane has caused vertigo, drowsiness, headache, anorexia and irritation of the eyes, nose, throat and lungs in humans. The chemical is also known to increase risks of liver cancer and other liver-related diseases. The College has monitored the groundwater surrounding Rennie Farm since 2012 due to the presence of buried lab animals, human tissue, fetuses and radioactive materials used for research. Clym Environmental Services, the company hired by Dartmouth to excavate Rennie Farm, reported finding rusted cans filled with “purple-colored liquid with strong solvent odor” that had leaked into the ground and discolored the groundwater “with a purple sheen.” The report details evidence of broken bottles, rusted metal cans, syringes and lab waste. Additionally, the soil was thought to contain long-lived radioactive agents. Environmental health and safety associate director Michael Cimis said that the College then immediately provided bottled water as well as an on-site filtration system that is working to remove the contaminant. However, on its website, environmental health and safety describes 1,4-dioxane as highly soluble in water. Based on the soil and groundwater collected, the remaining 1,4-dioxane at the site may be dissolved in groundwater located within the soil and fractured rock, and removal of soil alone will likely not remove all of the residual 1,4-dioxane. “The College is working as fast as they can. We are working with state supervision; the New Hampshire [Department of Environmental Services] supervises and guides all of our work,” Cimis said. He added that Dartmouth is now focusing on working to install a pump and treatment system. The goal of this treatment system is to control potential movement and migration of 1,4-dioxane. Cimis also said that the College’s groundwater expert as well as a number of different environmental experts are working on the site to identify the path of the moving chemical. The recent contamination finding was not surprising due to issues associated groundwater movement and elevation, moving down gradient into the north-northeast, Cimis said. The environmental cleanup is under the jurisdiction of the N.H. Department of Environmental Services, and the town of Hanover is not directly involved, Griffin said. She added that despite this, the town administration is ensuring all written communication between the N.H. Department of Environmental Services and Dartmouth concerning upcoming meetings are placed on the town website for transparency and accountability. 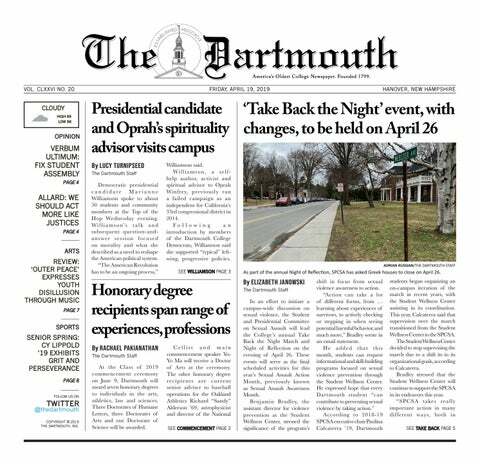 In an email, College spokesperson Diana Lawrence wrote that Dartmouth sent an email to the neighbors outlining new and ongoing remedial action. The email included the addendum to the College’s May 5 work plan, which proposed the installation of additional off-site groundwater monitoring wells.